The recipe is based upon Paula Deen’s creamy crock pot macaroni-n-cheese, but I changed quite a few things. I didn’t want to use a crock pot, as I was afraid the pasta would get too mushy. I wanted a nice, al dente pasta. 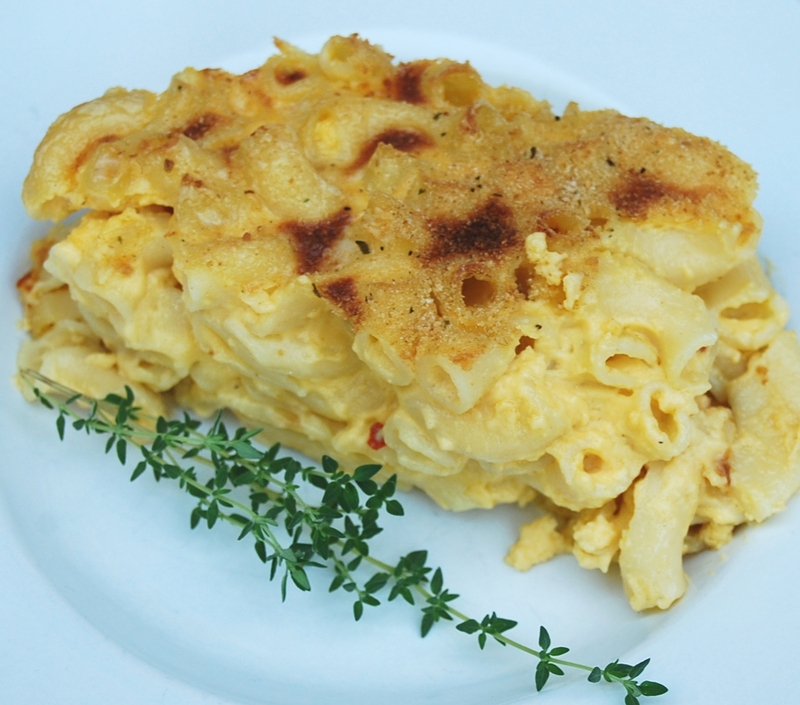 Here is a link to Paula’s Creamy Mac-n-Cheese. Now, here is what I did. Boil the pasta according to package directions; drain and set aside in its pot. In a saucepan, melt the four TBS of butter over low-medium heat. Stir in the grated cheddar cheese, allowing it to completely melt while stirring. Add the soup, sour cream, heavy cream, salt and pepper, dry mustard, and red pepper flakes, continuing to stir until it is mixed well. Add the eggs, stirring until everything is smooth and well-combined. In a large pot, combine the drained pasta and the cheese sauce, stirring until the macaroni is evenly coated with cheese. Transfer the pasta to a Pam-sprayed 2 quart casserole dish. Sprinkle top with a handful of bread crumbs or crushed buttery crackers, if you like. (I used Progresso bread crumbs, as I had them on hand.) Bake at 350 degrees F for about 25 minutes. Now, I do realize that you may be unhappy with the fat content in this dish. I understand. You could easily make some changes: use milk instead of cream, use light sour cream, use part-skim cheese, and use Smart Balance margarine. I used the light sour cream and cheese, as that is what I had on hand. As for the type of cheese, my cheddar was MILD, but you could move up to sharp or even extra-sharp, if you like those flavors. You could also add more red pepper flakes if you like a bit more heat. I think this is one of those great dishes that you can experiment with to find out what sets off that little explosion of joy for your tastebuds, as this recipe did for mine tonight! If you decide to try it, would you please come back after you do to let me know how you liked it, and/or what changes you made to personalize it to your tastes? I’d love to know. Happy eating! Previous Post Looking for a high-protein, easy lunch? This looks too good to be true. I can’t WAIT to try it!!! I only wish I could eat it right now. Can’t wait to try it. Mmmmm! You may want to double it, Chelle! 🙂 Enjoy! What do Australians know about macaroni and cheese?? I looked at your recipe and if it’s 1/10th as good as CoA’s was, I’ll be in heaven. The last recipe of yours that I made ended up with me being a hero around here. My tastebuds covered my eye teeth and I couldn’t see what I was typing. To celebrate National Macaroni Day…and because it’s so supremely wonderful ANY day. 🙂 ~enjoy!